The club championships have been updated by Chris Lawson, click here. The Trunce is the next race in the club championships on 3 September and don’t forget to enter the Bawtry Forrest trail race which is also a counter. The Cusworth 10k is the final road race the club hosts, enter it here. We will be looking for lets of people to marshal it if your not running. Please send race reports to Martin James. 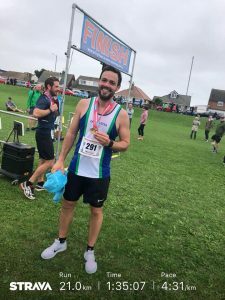 Michael wrote “Just short of 15 miles today with appalling marshalling at the fleetwood half meaning an extra loop of the course, reasonable time with weak and tired legs”. Another great turnout, the final trunce of the year is on 3 September and this is a counter in our club championships. Off road shoes recommended. Details here. 1st lady to finish at Scunthorpe was Sharron WOOD. PB’s for Phil BUSSEY (setting a new age group record), Mark WEBSTER, Stuart BEEBY. At Doncaster 1st to finish was Rhys GIBSON and the top 3 age graded athletes to finish were Phil BUSSEY, Kevin NEWMAN, Mick PAGE. First timers were Anthony WILKINSON, Henry NOKES, George PHILLIPS, Joe PHILLIPS, Samuel LAWSON, Margaret BUTLER, Peter BUTLER, Yvonne GIBBON, Michelle GUEST, Paul BROWN, Mark WEBSTER, George LAING, Simon PARKIN, Joe WARREN. PB’s for Nick NEWMAN, Sharon CARSON, Christopher WATERS, Sue BEEBY, Louise SHEERIN, Callum WILSON, John ATKINS, Wayne CODDINGTON, Julie CULL, Janet POWELL, Dee SCHADE. At Doncaster the first 5 to finish were all DAC members, Rhys GIBSON, Callum WILSON, Jonathan FRARY, Simon WRIGHT, Joe WARREN (great 1st parkrun) and the highest 3 age grade to finish were Phil BUSSEY, Simon WRIGHT, Rhys GIBSON.